British game developer Rare has announced that it is "making plans" for its very own online store which looks set to feature merchandise based on its popular creations. The news comes from the tweet below, with the company also taking the opportunity to show off an adorable Banjo-Kazooie plush that has us instantly itching to boot up the good ol' N64 once more. 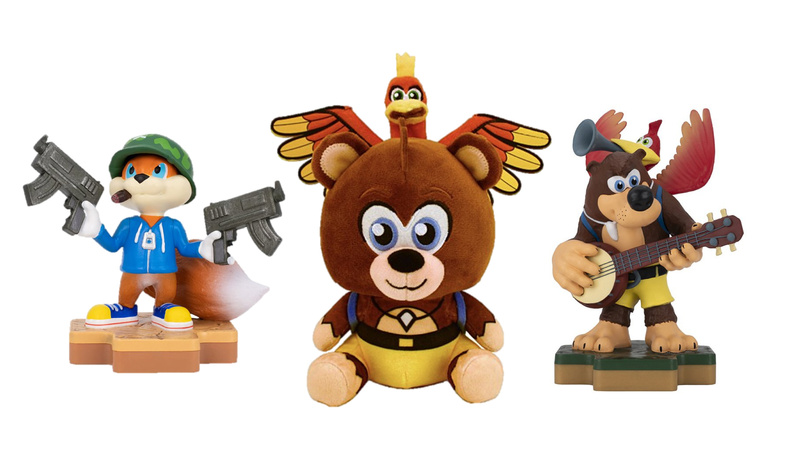 Just last week, Totaku Collection figures for both Banjo-Kazooie and Conker from Conker's Bad Fur Day were revealed, set to be available exclusively from Forbidden Planet and GAME stores in the UK (although Rare has since stated that it also expects to see them appear in the US). It looks like we're about to see a whole lot more in the near future, too; we're not sure how well a Pierce Brosnan GoldenEye 007 plush would turn out, but we suddenly (kind of) want one. What sort of stuff would you like to see in a Rare online store? Perhaps some Donkey Kong Country goodies? Feel free to share your most-wanted toy ideas down below. Those statues look pretty nice, but something's off with that plush. Does Rare really have enough IP for it's own store? Nintendo started it's own amiibo line and even they had to offer us 11 different versions of Link and a few of Mario to keep it going. Strange decision, considering they haven't done anything with their legacy IPs to warrant merchandise. Maybe they're secretly developing a new Banjo/Conker game and want to start hype? Wishful thinking probably. Lol, make a bloody game first guys. Jeez. Does this mean no Banjoo-Kazooie amiibo, which means no Banjo-Kazooie in Smash? @GrailUK Sea of Thieves is their newest. Or are you joking? Give me Zitz, Rash, and Pimple "amiibo" and I'm good. @Mando44646 Oh my bad, I didn't realise Banjo and Kazooie were in Sea of Thieves. As you were. @ReaderRagfish Yeah, what's off is that it's not on my desk! @rjejr I suppose they could offer something for each of Mumbo's transformations. Wait...... Wishy Washy Banjo in Smash, confirmed! They probably have enough to pull it off... but basically all these IPs have been abandoned since the 90s/early 00s. The only good thing rare has made in years. Microsoft really doesn't understand how to drive a competitive gaming market. @Mando44646 I'm not confused. I think you are having trouble with your inference mate They were hocking Banjo and Kazooie plushie. I thought maybe a game was in order lol. Honestly, don't worry about it. I actually quite like the Banjo plushie. I would love to have it on my shelf next to my Sly Cooper plushie! @rjejr Banjo, Conker, Perfect Dark, Battletoads, some Goldeneye (If you can do shirts that reference the game without using names or likenesses, wrestling does it a lot. ), Viva Pinata, Sabre Wulf and Jet Pac (For the old school line), Killer Instinct, and generally the Rare name with logos and such they can make merch out of. So are they making a game/gonna be in Smash, or are they just doing the "Mega Man Merchandise-Only" thing from some years ago? @GrailUK The Captain Falcon amiibo is a much worse situation, no new game in 14 years. Obviously they can't do Donkey Kong Country. Just what we need, a not so rare toy shop. This tells me that they have something in the works and are trying to get brand recognization going again. Their plush toys can get stuffed where is the new game? Actually I'm not sure I believe Rare are doing anything with games anymore. We are all waiting with bated breath - but maybe they just don't have a good game in them anymore. I hope they have a 3D DKC about to appear any moment - but that hope is diminishing. I'm starting to believe Ubisoft will be the secret force behind Prime 4 - but why exactly did Rare not get the job? When will those guys just bankrupt or quit already, so nintendo can get it's 64 library back! anyone remember when this company used to make videogames? @rjejr Yeah but depends on how far they plan to go. Shirts seem likely as that can appeal to nostalgia (There out shirts out there for really old systems so IPs should be a conversation starter), plushies are ideal for Banjo, Conker and Viva Pinata, you can do limited edition statues or anime-like figurines for the lesser known series like Jet Force Gemini and Kameo (Since those will be limited in number), posters can be done since there's a history of Rare art to put on posters, mugs, mouse pads, keyrings, the works. I wish I still had my original Nintendo made one. Why is RARE so highly praised? They havent done anything decent in over 20 years, maybe they werent much without Ninty watching over them. @Angelic_Lapras_King So what they really are is a head shop. But where are the Battletoads. huh. a rerelease of jet force gemini would be nice. Are they gonna use the IP's? Or are they gonna let them wither and die? AWESOME! I want Banjo-Kazooie remakes and new game after this! @Angelic_Lapras_King Most Viva Piñatas are great for this too. @Juma009 Nintendo never watched them, or helped them making the games as both Rare and Nintendo have explained multiple times. Nintendo did not even publish some games. Rare created all the new characters in the Donkey Kong universe including Diddy Kong and Donkey Kong's new design which was later made official by Nintendo. What have they done recently? Rare has released Sea of Thieves which has become a really good game after some content updates and also helped developing what is likely the best fighting game of this generation and all the Kinect and Kinect 2.0 games and development support until both were abandoned. Perfect Dark, Killer Instinct, Viva Pinata, Conker, Banjo, Sea of Thieves. I'd love some collectibles from all of those. Nice!! although the plush I have is the original Banjo Kazooie from the N64 era this looks nothing alike.